The skeletal muscles can be divided into three groups (figure 2.5): 1. Muscles governing movement of the upper extremities. 2. Muscles governing moment of the trunk and spine (including breathing musculature). 3. Muscles governing movement of the lower extremities. Resistance training methods refer to the strategy used for organising training sessions. Methods should be selected by the strength zone and goals of the workout. As highlighted in the previous section, knowing the client is key to maximising motivation when it comes to exercise. This section aims to progress this forward by outlining key behavioural strategies that could be used to enhance motivation towards exercising. 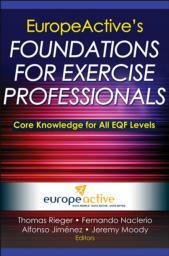 Endorsed by EuropeActive and framed in the Code of Ethical Practice, EuropeActive’s Foundations for Exercise Professionals contains the foundational knowledge for every level of the qualifications framework in Europe to help exercise professionals meet and maintain recognised professional standards. EuropeActive’s Foundations for Exercise Professionals provides core knowledge and industry standards to help exercise professionals serve their clients. Endorsed by EuropeActive, the continent’s leading standard-setting organisation in fitness and health, this text is an authoritative guide for current and future exercise professionals and training providers in Europe. The book uses scientific foundations to cover concepts and hands-on skills that promote best practices in exercise instruction and training. The content applies to all levels of the European Qualifications Framework (EQF) and associated job titles—the only resource to do so—and matches the core information for EQF levels 3 and 4. Thus, this instructional guide ensures smooth movement and work transfers among employers, educational institutions and countries in Europe. Easy-to-apply instruction accompanied by 88 full-colour photos and 68 illustrations offer an ideal visual learning experience. Complete descriptions and images detail proper form for common free-weight and machine-resistance training exercises. Explanations and recommendations are included for the most popular cardiorespiratory exercise equipment. Official nutrition recommendations prepare professionals to address clients’ concerns. The complete Code of Ethical Practice serves as a guide for all exercise professionals in Europe. EuropeActive’s Foundations for Exercise Professionals begins by covering the bones, joints, muscles and cardiovascular system to ensure a proper understanding of the body’s movement and physiology. Readers then learn the components of exercise theory and prescription, including energy systems; body composition; resistance, aerobic and flexibility training; warm-up and cool-down; and the principle of progression. The book helps professionals become role models in the industry with information on managing lifestyle through physical activity, health, nutrition, hydration and safety. After gaining foundational knowledge, readers will look closer at the role of the exercise professional, starting with building rapport, motivating, screening and assessing clients. The final chapters discuss the basic aspects of training: exercise technique using weight machines, free weights and cardiorespiratory equipment. Both aspiring and qualified exercise professionals should keep abreast of foundational information about all areas of the health and fitness sector in order to properly serve the industry and their clients. EuropeActive’s Foundations for Exercise Professionals is an ideal reference for promoting physical activity, making lifestyles healthier and guiding clients toward their fitness goals. A resource for individuals working toward the reference levels of the European Qualifications Framework and exercise professionals striving to comply with the latest industry standards and best practices. Fernando Naclerio is the principal lecturer in strength training and sport nutrition and the MSc programme leader of strength and conditioning at the Centre for Sports Science and Human Performance at the University of Greenwich, UK. He is a strength and conditioning coach (CSCS-NSCA) and a certified international society sport nutritionist (CISSN). Dr. Naclerio has more than 30 years of experience as a coach, consultant and academic in many countries in Europe and South America. He has published five books, multiple book chapters and more than 100 scientific papers on training and sport nutrition. Dr. Naclerio’s research is currently focused on the effects of resistance training and nutrition strategies on performance, injury prevention and muscle structure as well as morphology in children, adolescents and older adults. Alfonso Jiménez, PhD, CSCS, NSCA-CPT, FLF, is a professor of exercise and health and the faculty dean of the health, exercise and sport sciences department at European University of Madrid (Spain) and a member of the scientific advisory board of UKActive Research Institute. Dr. Jiménez holds a visiting professorial appointment at Victoria University in Melbourne, Australia, as the international research associate. He is the chair of the Fitness Australia/ISEAL research programme and scientific advisory committee at the University of Greenwich in London. During the time that he was head of school and deputy dean at Victoria University, Dr. Jiménezz served as a professor and head of the Centre for Sports Sciences and Human Performance at the University of Greenwich. From 2009 to 2012, Professor Jiménez was the chairman of the standards council of EuropeActive, which at the time was called the European Health & Fitness Association. He was awarded honorary membership in recognition of his outstanding service. Dr. Jiménez’s background before entering academia centred on the fitness industry in management, research and sales. Jeremy Moody is the MSc programme director for strength and conditioning at Cardiff Metropolitan University in Wales, UK, and a frequent national and international speaker in the fields of strength and conditioning and elite sport performance management. Dr. Moody’s experience extends across many able-bodied and disabled sports, and he has worked with many successful athletes at the Commonwealth, European, World, Olympic and Paralympic levels of competition as well as with many youth and developing athletes. Previously, he was the performance director for Great Britain Wheelchair Rugby and the Welsh Judo Association, a senior performance manager for UK Athletics and a regional lead strength and conditioning coach for the English Institute of Sport.